In his forties, the Reverend Charles Howard still cut an impressive figure. A married Presbyterian minister in Toronto’s east end, Howard was popular with the congregation that elected him, especially with the ladies, and most particularly with Miss Sarah Dignam. Respected in the community, Howard, as Visitor for the House of Industry, sat in judgment on the poor, assessing their applications for the workhouse. But now Howard is dead, stabbed and brutally beaten by someone he invited into his office. His watch and boots are missing. Has some poor beggar he turned down taken his vengeance? Murdoch’s investigation takes him into the arcane Victorian world of queer plungers — men who fake injury all the better to beg — and the destitute who had nowhere left to turn when they knocked on the Reverend Howard’s door. 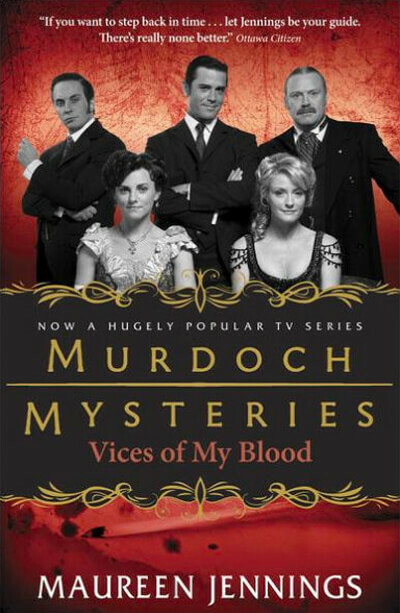 “Maureen Jennings’ new novel, Vices of My Blood, picks up where her previous William Murdoch mystery left off. Only two months have passed since the end of Night’s Child, when Murdoch’s lover, Enid Jones, left Victorian Toronto and moved back to Wales to be with her ailing father. Murdoch has received his expected promotion to detective and is settling into his new living arrangements. “The story begins with the Toronto police being warned about the imminent arrival of a group of “queer plungers” (small-time con artists) when they receive news of the murder of the Reverend Charles Howard. Murdoch takes the call and finds Howard in his office at Chalmers Presbyterian Church. He’s been kicked in the head and stabbed in the neck with a letter opener. His boots have been taken and it appears that his pocket watch has been stolen. “The simple explanation of a robbery gone terribly wrong is accepted by many, but there are enough inconsistencies to keep Murdoch investigating. The boots are eventually found on the feet of one of the queer plungers, and his story leads Murdoch to go undercover to live as a vagrant. Meanwhile, another poor family falls victim to the murderer as he tries to cover his tracks.